The 0.17.0 release is a very exciting release of Salt, this brings to Salt some very powerful new features and advances. The advances range from the state system to the test suite, covering new transport capabilities and making states easier and more powerful, to extending Salt Virt and much more! So if the release happens in November of 2013 the number will be 13.11.0, the first bugfix release will be 13.11.1 and so forth. The new Halite web GUI is now available on PyPI. A great deal of work has been put into Halite to make it fully event driven and amazingly fast. 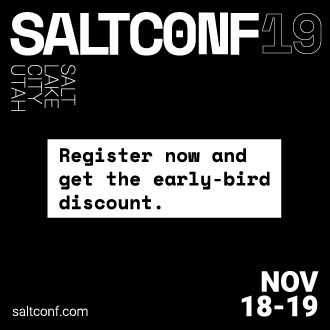 The Halite UI can be started from within the Salt Master (after being installed from PyPI), or standalone, and does not require an external database to run. It is very lightweight! This initial release of Halite is primarily the framework for the UI and the communication systems, making it easy to extend and build the UI up. It presently supports watching the event bus and firing commands over Salt. Halite is, like the rest of Salt, Open Source! Much more will be coming in the future of Halite! The new salt-ssh command has been added to Salt. This system allows for remote execution and states to be run over ssh. The benefit here being, that salt can run relying only on the ssh agent, rather than requiring a minion to be deployed. The salt-ssh system runs states in a compatible way as Salt and states created and run with salt-ssh can be moved over to a standard salt deployment without modification. Since this is the initial release of salt-ssh, there is plenty of room for improvement, but it is fully operational, not just a bootstrap tool. Salt is designed to have the minions be aware of the master and the master does not need to be aware of the location of the minions. The new salt roster system was created and designed to facilitate listing the targets for salt-ssh. The roster system, like most of Salt, is a plugin system, allowing for the list of systems to target to be derived from any pluggable backend. The rosters shipping with 0.17.0 are flat and scan. Flat is a file which is read in via the salt render system and the scan roster does simple network scanning to discover ssh servers. This is a major change in how states are evaluated in Salt. State Auto Order is a new feature that makes states get evaluated and executed in the order in which they are defined in the sls file. This feature makes it very easy to see the finite order in which things will be executed, making Salt now, fully imperative AND fully declarative. The requisite system still takes precedence over the order in which states are defined, so no existing states should break with this change. But this new feature can be turned off by setting state_auto_order: False in the master config, thus reverting to the old lexicographical order. The state.sls runner has been created to allow for a more powerful system for orchestrating state runs and function calls across the salt minions. This new system uses the state system for organizing executions. This allows for states to be defined that are executed on the master to call states on minions via salt-run state.sls. Salt Thin is an exciting new component of Salt, this is the ability to execute Salt routines without any transport mechanisms installed, it is a pure python subset of Salt. Salt Thin does not have any networking capability, but can be dropped into any system with Python installed and then salt-call can be called directly. The Salt Thin system, is used by the salt-ssh command, but can still be used to just drop salt somewhere for easy use. Events have been updated to be much more flexible. The tags in events have all been namespaced allowing easier tracking of event names. The popular git fileserver backend has been joined by the mercurial fileserver backend, allowing the state tree to be managed entirely via mercurial. The external logging handler system allows for Salt to directly hook into any external logging system. Currently supported are sentry and logstash. The testing systems in Salt have been greatly enhanced, tests for salt are now executed, via jenkins.saltstack.com, across many supported platforms. Jenkins calls out to salt-cloud to create virtual machines on Rackspace, then the minion on the virtual machine checks into the master running on Jenkins where a state run is executed that sets up the minion to run tests and executes the test suite. This now automates the sequence of running platform tests and allows for continuous destructive tests to be run. The testing libraries for salt have been moved out of the main salt code base and into a standalone codebase. This has been done to ease the use of the testing systems being used in salt based projects other than Salt itself. The external auth system now supports the fantastic Stormpath cloud based authentication system. Extensive additions have been added to Salt for LXC support. This included the backend libs for managing LXC containers. Addition into the salt-virt system is still in the works. Salt is now able to manage users and groups on Minions running macOS. However, at this time user passwords cannot be managed. Pillar data can now be derived from Django managed databases.